I’m going to review what is, in my opinion, one of the three best SMS games of all times and truly represents the zenith of the Master System (it’s a big responsibility!! :-)). When I gave it to my brother as a Christmas present in 1992 I would never have anticipated that Sega could make a better Sonic game for the SMS. 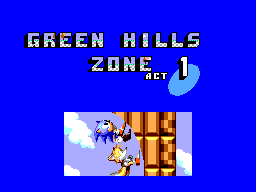 Contrary to the Mega drive version, we can’t play with both sonic and tails, we only play with the first one and have to save tails from the evil DR. Robotnik, who, once again, tries to make Sonic’s life a living hell. 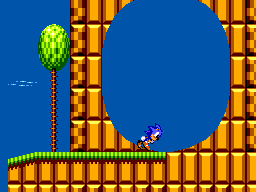 We must get to Crystal Egg Zone and try to rescue our sidekick from a terrible destiny. 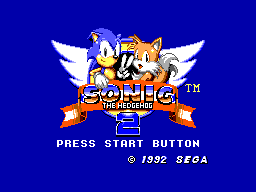 Sonic 2 has great replay value, I know that the game isn’t that hard to finish, but the game has a catch, you need to get the chaos emeralds in the first 5 areas in order to gain the 6th one from silver sonic in the Scrambled Egg Zone and be able to go to the Crystal Egg Zone, defeat Robotnik, save tails and reach the happy end. If you prefer Darth Vader to Luke Skywalker you probably won’t worry about tails and will never put the extra effort necessary to find all the emeralds. But, if you like to play and experience everything that a game has to offer, you will reach the end of these game several times in order to save tails, catch as many lives as possible and reach the highest score possible. This game has a huge replay value and I’m a living proof of it, I must have reached the end of this game at least 10-15 times (10/10).